A male infant was delivered spontaneously at 29+3 weeks and transferred to the local neonatal unit for uplift in care. 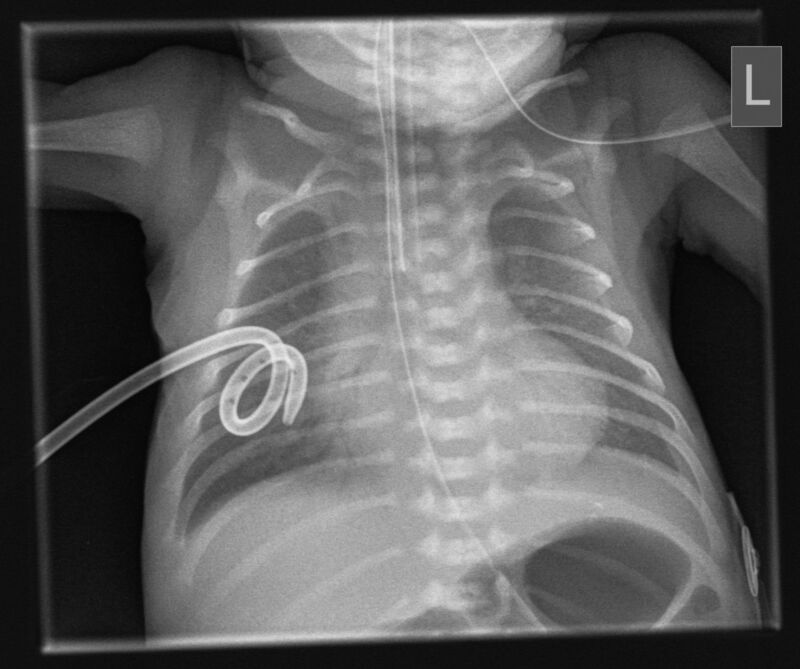 This included 24 hours of ventilation, 12 hours of dobutamine and placement of a peripherally inserted central catheter (PICC) for total parenteral nutrition (TPN). By 24 hours he was extubated onto Optiflow at 6 L/min and Fraction of Inspired Oxygen (FiO2) of 0.21. Expressed breastmilk was commenced whilst awaiting PICC placement. A 22G 80 mm Leaderflex PICC was aseptically inserted on day 2 into the right antecubital fossa. The line did not bleed but flushed easily. A 0.9% sodium chloride infusion was commenced whilst awaiting confirmation of line position. Chest X-ray showed the PICC projected over the subclavian vein with mild residual airspace shadowing in both lungs (figure 1). The PICC position was felt to be acceptable when the X-ray was reviewed prospectively and retrospectively. 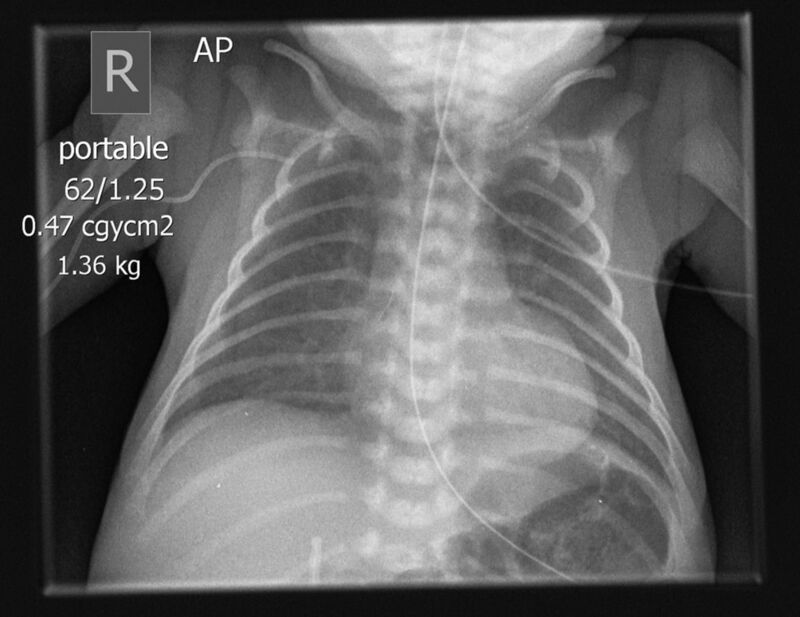 Chest X-ray showing peripherally inserted central catheter line placement. AP, anteroposterior. TPN was commenced at 16:00. At 23:00 the nurse noted the baby had increased work of breathing with an increased FiO2 from 0.21 to 0.7—Optiflow was changed to Continuous Positive Airway Pressure (CPAP). A small swelling was noted on the right lateral chest wall which prompted immediate discontinuation of TPN and removal of the PICC. On registrar review the baby was grunting, with recession and oxygen saturations of 92% in 0.7 FiO2 on CPAP. Clinical examination confirmed bilateral air entry and no transillumination with a cold light. A sudden deterioration led to Neopuff resuscitation. Urgent chest X-ray showed a new right-sided pleural effusion (figure 2). Chest X-ray showing new right-sided pleural effusion. The airway was secured with an endotracheal tube and ventilation improved. When lignocaine was infiltrated, a white liquid was aspirated from the pleural cavity. The consultant felt confident TPN was in the chest cavity and inserted the 8 Fr chest drain, which was uncomplicated. From the pleural space, 20–30 mL of fluid was drained and second-line antibiotics were commenced. Repeat chest X-ray showed improved airspace shadowing and resolving right-sided pleural effusion (figure 3). 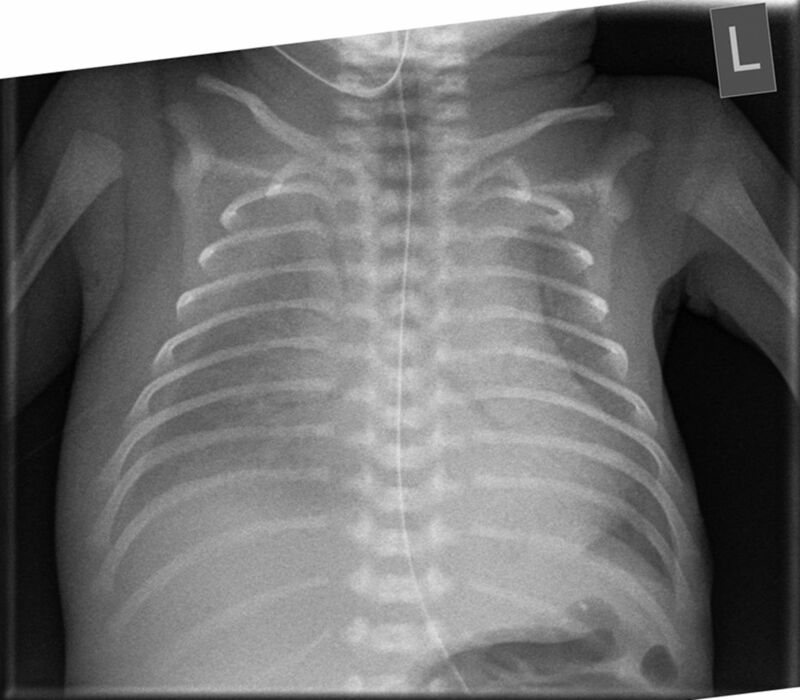 Chest X-ray showing right-sided chest drain. On day 4 an X-ray confirmed resolution of the pleural effusion and the chest drain was removed. The baby was extubated on day 5 onto Optiflow at 8 L/min. Antibiotics were discontinued following three C-reactive protein tests of <1 and negative blood cultures. Delivery of TPN was continued via a peripheral cannula. Following biochemistry analysis, the pleural fluid was confirmed to be consistent with TPN contamination: visibly lipaemic, protein of 3 g/L, triglycerides of 4.40 mmol/L and creatinine of 58 μmol/L. On day 6 of life, the baby was fully enterally fed and self-ventilating without respiratory support. To image intermediate peripherally inserted central catheter (PICC) line placement using ultrasound or X-ray with contrast to identify possible malposition prior to using the line. To ensure PICC lines are effectively secured at insertion. To monitor PICC line position with daily recording of the length at the insertion site and ultrasound surveillance. Contributors Substantial contributions to the conception or design of the work, or the acquisition, analysis or interpretation of data: RVC, JFA, DGB. Drafting the work or revising it critically for important intellectual content: RVC, JFA, DGB. Final approval of the version published: RVC, DGB. Agreement to be accountable for all aspects of the work in ensuring that questions related to the accuracy or integrity of any part of the work are appropriately investigated and resolved: RVC, JFA, DGB.